AudioSlimmer is an easy-to-use audio converter, useful to create Windows Media Audio 8 files from your existing MP3s or WAVs. It can also be used to extract WAVs from MP3s, to play music and to manage the files. AudioSlimmer provides multiple file conversions and enables to extract only a specified section of audio files. 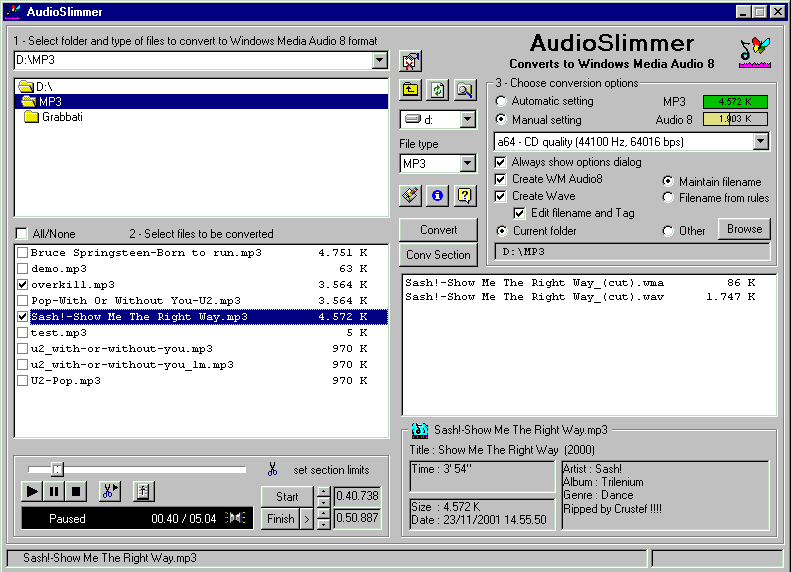 AudioSlimmer produces WMA files, encoded using the revolutionary Windows Media Audio8 format, that provides: - CD-Quality Audio at half the size of MP3 - WM Audio 8 encoding captures more of the original WAV audio file than MP3 or Real Audio 8.